This week the Mumbai airport has been really busy welcoming Bollywood celebrities on their travel schedules as some left for promotional tours while others planned a family trip for the Diwali weekend. The week started with Deepika Padukone leaving for Dubai on Sunday, October 15, 2017 wearing a casual beige top with blue denims and fancy black sunglasses with furry black loafers to complete the look. She also carried a brown sling bag for the ultra-chic look. Next it was Kareena Kapoor who sported the stylish workwear of a monochrome shirt with black straight-fit pants and a long white jacket along with black pumps and black handbag while returning from Delhi after completing her first schedule shoot of Veere Di Wediing – her comeback film after a maternal break. She was spotted along with her less than a year-old son, Taimur Ali Khan. 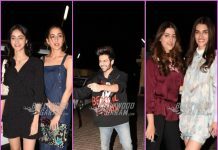 The week ahead started with Golmaal Again team leaving for Delhi on a promotional tour for their film Golmaal Again that released on October 20, 2017. While Parineeti Chopra, the latest addition to the golmaaal franchise wore a yellow graphic jersey with grey shorts and white loafers, Ajay Devgn was all smiles for the cameras in a blue shirt and a pair of denims. Tushaar Kapoor, meanwhile, was seen in a printed shirt and white trouser combo that he sported with sneakers. 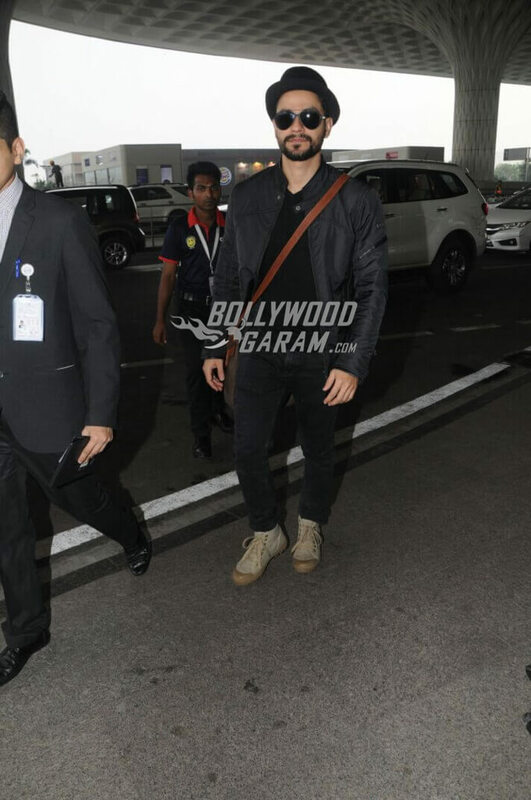 Kunal Kemmu who recently welcomed his daughter, Inaaya Naumi Kemmu home was seen at the airport too leaving for Delhi in a black t-shirt, black leather jacket and black denims along with stylish round glares and a black hat. He completed the look with a brown sling bag hung over his shoulder. The same day, October 16, 2017 saw Kangana Ranaut who has been mired in several controversies off late as she left for her hometown ahead of Diwali. She will next be seen in Manikarnika: The Queen of Jhansi. Two days later on Wednesday, October 18, 2017, Ranbir Kapoor was spotted on his travel schedule in a military print shirt, a black pullover matched with black denims, sneakers, glares and a black hat. Later, the same day, it was time for the Golmaal Again team to return from their Delhi tour. While Parineeti Chopra was seen in a grey pullover, black leggings and white loafers with a stylish orange sling bag, Ajay Devgn sported a white shirt-denim combo. 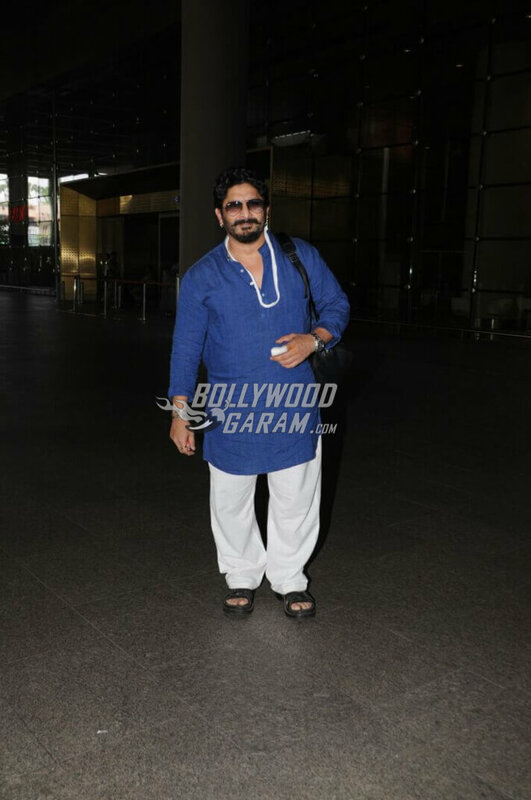 Arshad Warsi seemed to have injured himself and was seen in an ethnic blue kurta and white pyjama outfit. The next day again it was busy at the airport with Sonam Kapoor welcoming her friend, Anand Ahuja at the domestic airport and was spotted in a car with him. October 19, 2017 – the Diwali day also saw Hrithik Roshan leaving for Goa for the festival holidays with his family- ex-wife Susanne Khan and their two sons. Ajay Devgn too followed suit and left with his wife Kajol and kids for Goa for a family trip over the Diwali weekend after his movie helmed by Rohit Shetty, Golmaal Again released on October 20, 2017. The weekend is almost here and Bollywood celebs seem all ready to welcome the holidays with their busy travel schedules and trips. 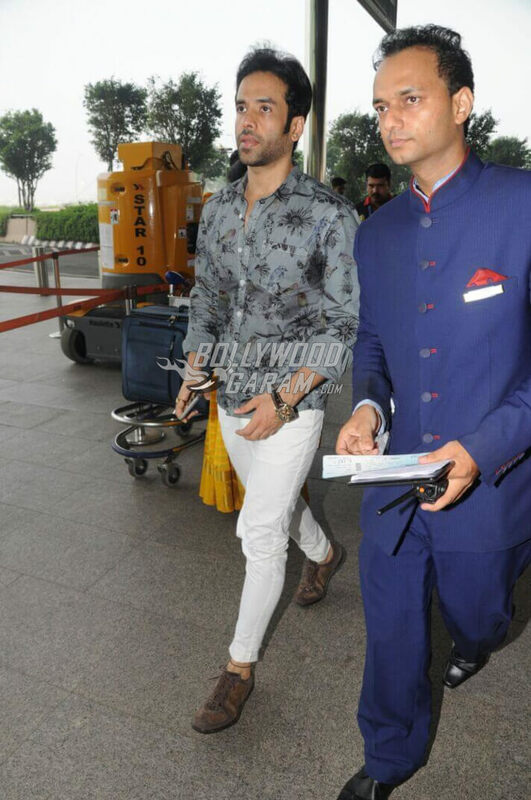 Exclusive photos of Bollywood celebs at the airport this week!